Paraproteins are monoclonal Igs that accumulate in blood as a result of abnormal excess production. These circulating proteins cause a diversity of kidney disorders that are increasingly being comanaged by nephrologists. In this review, we discuss paraprotein-related diseases that affect the glomerulus. We provide a broad overview of diseases characterized by nonorganized deposits, such as monoclonal Ig deposition disease (MIDD), proliferative GN with monoclonal Ig deposits (PGNMID), and C3 glomerulopathy, as well as those characterized by organized deposits, such as amyloidosis, immunotactoid glomerulopathy, fibrillary GN, and cryoglobulinemic GN, and rarer disorders, such as monoclonal crystalline glomerulopathies, paraprotein–related thrombotic microangiopathies, and membranous-like glomerulopathy with masked IgGκ deposits. This review will provide the nephrologist with an up to date understanding of these entities and highlight the areas of deficit in evidence and future lines of research. Paraproteinemias are diseases in which excessive amounts of paraproteins, or monoclonal Igs, are present within the blood because of a clonal proliferation of B lymphocytes or plasma cells. Although paraproteinemic renal diseases are often associated with an immunoproliferative disorder, such as multiple myeloma (MM), B cell non–Hodgkin lymphoma (NHL), lymphoplasmacytic lymphoma (LPL), plasmacytoma, or primary light chain (AL) amyloidosis, they can also occur as a result of a nonproliferative monoclonal gammopathy (MG; monoclonal gammopathy of undetermined significance [MGUS]) (1). More recently, a new entity of MG of renal significance has been established to describe a monoclonal process that involves only the kidneys (2). This review will specifically discuss glomerular involvement in paraproteinemias, which for the purposes of this discussion, will be categorized into diseases with nonorganized (granular) or organized (fibrils or microtubules) deposits on the basis of the pathologic features of the paraproteins within the kidney. Importantly, although disorders, such as fibrillary GN (FGN), immunotactoid glomerulopathy (ITG), and cryoglobulinemia, have been associated with paraprotein disease and are, therefore, included in this discussion, the clinician should recognize that MG involvement is variable in the pathogenesis of these diseases. Monoclonal Ig deposition disease (MIDD) is defined as the deposition of nonamyloid monoclonal light and/or heavy chains in basement membranes. Three subtypes of MIDD have been reported on the basis of the composition of the deposits: light chain deposition disease (LCDD) (3,4), light and heavy chain deposition disease (LHCDD) (5,6), and heavy chain deposition disease (HCDD) (7–9). LCDD is the most common, accounting for 19% of kidney biopsies performed in patients with multiple myeloma (10), whereas LHCDD and HCDD are rare. In LCDD, the light chains are predominantly of the κ-isotype and VκIV subgroup (11–15) (Table 1). In HCDD, deposits consist mostly of γ-chains, with a deletion in the first constant (CH1) domain, and less commonly, α- and μ-chains (7,12,13,16,17). Patients with MIDD typically present with proteinuria, renal impairment, and hypertension (12–14). Heavier proteinuria and nephrotic syndrome occur more frequently in patients with HCDD than those with LCDD or LHCDD (13,18). LCDD without significant proteinuria (<0.5 g/d) has also been described (18,19). In a recent study of 64 patients with MIDD (51 with LCDD, seven with HCDD, and six with LHCDD), evidence of paraproteinemia was seen in 97% of patients, with 59% of patients having a diagnosis of MM and one patient having a diagnosis of LPL (13). A monoclonal M spike was detected in 86% of patients by serum protein electrophoresis (SPEP) or urine protein electrophoresis (UPEP) and immunofixation, and all patients with MIDD had an abnormal serum free light chain ratio. Similar clinical features have been reported in other observational studies (12,15). 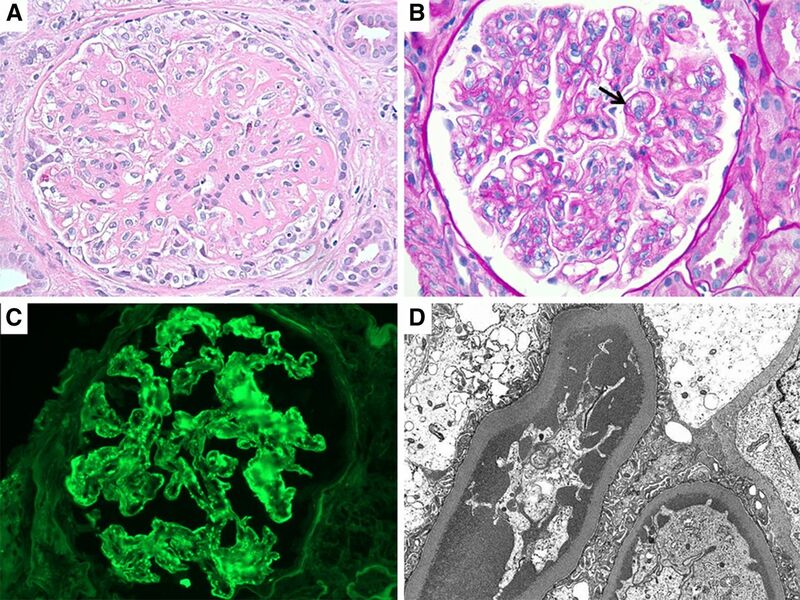 The most characteristic finding in MIDD by light microscopy (LM) is a nodular sclerosing glomerulopathy (5,13,20,21), which may resemble the pattern seen in nodular diabetic nephropathy or AL amyloidosis (Figure 1). Immunofluorescence (IF) reveals diffuse linear staining along glomerular, tubular, and vascular basement membranes for monotypic light chains in LCDD, monotypic heavy chains in HCDD, and both heavy and light chains in LHCDD. Complement components are generally absent in LCDD, whereas staining for C3 and C1 in monoclonal deposits may be seen in LHCDD and HCDD (12). Electron microscopy (EM) shows deposition of powdery electron–dense deposits along renal basement membranes. LCDD may also coexist with cast nephropathy, AL amyloidosis, and FGN on kidney biopsy (12,22). Histopathology of monoclonal Ig deposition disease (MIDD). Nodular glomerulosclerosis is the most common light microscopic appearance in MIDD. (A) (Jones methenamine silver) shows two glomeruli, which are markedly enlarged by mesangial nodule formation. The silver–positive mesangial matrix is admixed with pink silver–negative deposits, and there is prominent mesangial proliferation. Magnification, ×200. (B) Periodic acid–Schiff (PAS) staining shows the deposits of MIDD to be strongly PAS positive. This staining profile helps in differentiating MIDD from amyloidosis, where deposits are PAS pale and Congo red positive. Magnification, ×400. (C) Immunofluorescence in MIDD shows diffuse linear staining of all basement membranes in the kidney, including glomerular and tubular basement membranes and often, vessel wall myocyte basement membranes. The mesangial nodules are also seen to strongly stain with the deposited paraprotein (κ-light chain). Magnification, ×200. (D) Electron microscopy shows the characteristic punctate, powdery electron–dense deposits lining the inner surface of the glomerular basement membrane. In contrast, these granular deposits typically form along the outer surface of the tubular basement membranes (not shown). Magnification, ×20,000. The optimal treatment of MIDD is not well defined but typically focuses on the treatment of the underlying hematologic malignancy. Bortezomib-based regimens are currently favored because of their safe use in patients with renal impairment, including those on dialysis (18,23,24). The prognosis of MIDD is variable (12,14,18,25). Before the advent of novel antimyeloma agents, such as proteasome inhibitors, patients with LCDD had a median time to ESRD of 2.7 years and mean survival of 4.1 years (14). Outcomes in the era of novel antimyeloma agents were examined in a recent retrospective analysis of 49 patients with MIDD (35 with LCDD, 12 with HCDD, and two with LHCDD) treated with a bortezomib-based regimen (18). Overall hematologic response determined by the difference between involved and uninvolved serum free light chains (dFLCs), a recently validated parameter for monitoring disease response in MM (26), was achieved in 91%. Renal response as defined by a 50% reduction in 24-hour proteinuria in the absence of a reduction in eGFR≥25% or increase in serum creatinine ≥0.5 mg/dl was achieved in 53% of patients. A post-treatment dFLC of 40 g/L was identified as an independent predictive factor of renal response, suggesting that hematologic response affects renal outcomes in MIDD. Patients with evidence of both MIDD and cast nephropathy have been shown to have worse renal and overall survival (12,15). Proliferative GN with monoclonal Ig deposits (PGNMID) was first described in 2004 as an immune complex GN with glomerular monoclonal Ig deposits. The etiology and pathogenesis of PGNMID remain unclear, although it has been postulated that the GN may arise in the course of a normal immune response that stimulates B cell clonal proliferation and production of monoclonal IgG that self-aggregates and deposits in the glomerulus (27). IgG3 is the most common IgG subtype identified by IF within the glomerular deposits (27). The propensity for IgG3 to deposit within the glomeruli may be explained by its high molecular weight, positive charge, ability to self-aggregate, and capacity for fixing complement. PGNMID has been associated with hematologic neoplasms, including MM, chronic lymphocytic leukemia (CLL), and NHL (28,29); parvovirus B19 infection (30); and autoimmune hemolytic anemia (31). The clinical features of PGNMID were reported in a series of 37 patients (27). Patients were predominantly white women with a mean age of 54.5 years old. Forty-nine percent of patients presented with nephrotic syndrome, and 68% had renal insufficiency. Seven (19%) patients had a monoclonal M spike in both serum and urine, and four (11%) had a detectable serum M spike only. Only one patient had a diagnosis of MM. Serum cryoglobulin titers were negative in all patients. Hypocomplementemia was seen in 10 of 37 patients. PGNMID most commonly manifests as a membranoproliferative GN (MPGN) or endocapillary proliferative GN by LM (Figure 2) (27,32). IF reveals glomerular deposits composed of a single IgG subtype accompanied by either κ- or λ-light chain. IgG3κ is the most commonly stained glomerular deposit (33). EM shows granular electron–dense deposits, which must lack substructure that would suggest an alternative diagnosis. There must also be no clinical evidence of cryoglobulinemia to avoid misdiagnosis of a type 1 cryoglobulinemic GN. Because the vast majority of patients with PGNMID have renal-limited disease and do not develop a hematologic malignancy, such as MM (27), the utility of a bone marrow biopsy is uncertain (34). Histopathologic features of proliferative GN with monoclonal IgG deposits (PGNMID). PGNMID can show a wide range of patterns of proliferation, and the case pictured here shows a membranoproliferative pattern. (A) Shows a glomerulus with nearly circumferential involvement by a crescent. The glomerular mesangium is expanded by glassy eosinophilic deposits, which are also thickening glomerular basement membranes and associated with endocapillary proliferation hematoxylin and eosin (H&E). Magnification, ×400. (B) Periodic acid–Schiff staining highlights segmental duplication of the glomerular basement membranes (arrow). Immunofluorescence reveals strong granular positivity for IgG and κ but no significant staining for λ. Magnification, ×400. (C) Staining for IgG subtypes 1–4 reveals strong staining for IgG3, but it is negative for the other IgG subtypes (not shown). Magnification, ×400. (D) Electron microscopy shows prominent subendothelial deposits without evidence of substructure. Magnification, ×6000. Renin-angiotensin system blockade and immunomodulatory therapy with steroids, cyclosporine, cyclophosphamide, mycophenolate mofetil, rituximab, and bortezomib have been used to treat PGNMID with varying results (27). Case reports support the use of rituximab for CLL-associated PGNMID (29). Larger studies are required to define the optimal therapy for PGNMID. The renal prognosis of these patients remains poor. Over a mean of 30 months, 37.5% patients had persistent CKD, and 21.9% progressed to ESRD (27). PGNMID recurs frequently after renal transplant (34) and manifests as allograft dysfunction and proteinuria. Early aggressive immunosuppressive therapy with steroids, rituximab, cyclophosphamide, or plasmapheresis may help to stabilize the disease (34). C3 glomerulopathy is a recently described glomerular disorder that results from dysregulation of the alternative complement pathway (AP). The term C3 glomerulopathy comprises C3GN (35) and dense deposit disease (DDD), both of which show predominant glomerular C3 accumulation without significant Ig staining (36). Although the pathogenesis of C3 glomerulopathy has been attributed to genetic mutations in and/or antibodies to the components of the AP (37), in some patients, these defects are insufficient to activate the disease, and a second hit, such as infection (38), may be required. Recent evidence has also shown an association between C3 glomerulopathy and MG (36,39–41). Monoclonal λ-light chains can activate AP by acting as a mini-autoantibody against complement factor H (CFH) (42–44). More recently, studies have shown that Igs, which may have false negative staining by routine frozen IF, may be unmasked if IF is performed on paraffin–embedded tissue sections after pronase digestion (45,46). This technique has revealed the presence of monotypic Igs in patients with MPGN on LM who would have otherwise carried a diagnosis of C3 glomerulopathy. Importantly, these findings suggest that glomerular paraprotein deposition may play a role in the pathogenesis of a subset of these patients (45). Three recent case series have described the clinical features of C3GN and DDD associated with MG (39,40,44). Patients with C3GN and MG are, on average, in the fifth to sixth decade of life and older than those with C3GN without MG (39,40). Hypertension, nephrotic-range proteinuria, and CKD are common. Most patients with either C3GN or DDD with MG have MG of renal significance, although smoldering myeloma and small lymphocytic lymphoma/CLL have been reported (39,40,44). In both case series of C3GN and MG, most patients had low serum C3 and normal C4 levels, and no tested patients had any detectable mutations in genes encoding complement regulatory proteins, including CFH, CFI, and MCP. In one study, zero of six patients had C3 nephritic factor (C3NeF) (40). By contrast, in the other case series, seven of nine patients had evidence of abnormalities in the AP, including two with positive C3NeF, two with elevated serum–soluble membrane attack complex levels, and six with functional abnormalities of the AP (39). Three patients were found to have the CFH risk polymorphism Y402H. Among 10 patients with DDD and MGUS, one patient who underwent AP evaluation was negative for C3NeF and showed low AP functional activity in vitro consistent with complement activation in the serum, low levels of factor H autoantibodies, and heterozygosity for the H402 allele of factor H (44). By LM, C3 glomerulopathy associated with MG can exhibit a variety of patterns, including MPGN, mesangial proliferative GN, endocapillary proliferative GN, and crescentic GN (39,40). IF reveals diffuse, bright, granular glomerular staining for C3 without significant staining for Ig light or heavy chains, C4, or C1q (39,40). Paraffin IF should be considered in all patients with an MPGN pattern on LM and negative IF to check for masked monotypic Igs that can be present in about one third of patients (45,46). EM shows electron-dense deposits, typically distributed in mesangial and subendothelial areas but occasionally, also involving the subepithelial space. Laser microdissection and tandem mass spectrometry (LMD/MS)–based proteomic analysis can be used to confirm the presence of complement components and absence of Ig. The optimal treatment of C3 glomerulopathy associated with MG remains to be defined. In the case series by Zand et al. (39), prednisone alone or in combination with other immunosuppressants, including azathioprine, cyclophosphamide, and mycophenolate mofetil, reduced proteinuria and stabilized renal function in three of four treated patients, whereas one patient progressed to ESRD. Treatment with dexamethasone and bortezomib reduced λ-light chains, normalized the κ-free light chain-to-λ-free light chain ratio, stabilized renal function, and eliminated proteinuria in one patient. Another patient with CLL who was treated with rituximab, cyclophosphamide, vincristine, and prednisone experienced a substantial reduction in proteinuria and improvement in renal function and hematuria (39). Thus, targeting the MG with chemotherapeutic agents directed against paraprotein-producing cells (either plasma cells or B lymphocytes) may be an effective therapeutic approach to consider for patients with C3 glomerulopathy associated with MG. The use of anticomplement C5 agents, such as eculizumab, has shown promise in the treatment of C3 glomerulopathy (47–55); however, the use of such agents with C3GN associated with paraproteinemias has not been well studied. Ig-derived amyloidoses, in which the amyloid fibril is composed of monoclonal Ig fragments produced by an underlying plasma cell dyscrasia, account for the vast majority (85.9%) of patients with renal amyloidosis and include AL, heavy chain (AH), and heavy and light chain (AHL) amyloidosis (56). Among these, AL amyloidosis is the most common (94.3%), with an incidence rate in the United States of 6.1–10.5 patients per million person-years (57). Specific light chains are thought to have abnormal amino acid sequences that predispose them to form amyloid. Recent evidence suggests that uptake of light chains by mesangial cells is critical to amyloid formation in AL amyloidosis (58,59). Approximately 70% of patients with AL amyloidosis have renal involvement, with 4%–5% of patients on dialysis at the time of diagnosis (60). The clinical features of patients with AL/AH/AHL amyloidosis at the time of kidney biopsy were recently described in a study of 474 patients with renal amyloidosis (56). Renal impairment was seen in 47% of patients. Median 24-hour urine protein was 6.2 g, and 68% of patients had full nephrotic syndrome. Differential characteristics between renal AL and AH/AHL amyloidosis have also been reported. Compared with patients with AL amyloidosis, those with AH/AHL amyloidosis had less concurrent cardiac involvement, a higher incidence of hematuria, better renal response to therapy, and better patient survival (61). No differences were observed in the degree of albuminuria, proportion of patients with nephrotic syndrome, renal function at presentation, serum albumin, hematologic response, or progression to ESRD (61). Diagnosis of AL amyloidosis is by pathology using tissue that is most readily available and suspected to be involved. Identification and quantification of the light chain clone are with SPEP and UPEP with immunofixation and serum free light chain assay, and bone marrow biopsy is performed to look for concurrent myeloma or other lymphoproliferative disorders. A noninvasive workup to determine the extent of organ involvement includes a basic metabolic panel, 24-hour urine protein collection, cardiac biomarkers, electrocardiogram, echocardiography, alkaline phosphatase, and clotting factors (Table 3) (62–64). Amyloid deposits can involve any combination of renal compartments, including glomeruli, vessels, tubular basement membranes, and interstitium (Figure 3, Table 2). In general, more pronounced glomerular involvement is associated with heavier proteinuria. The gold standard for diagnosis is demonstration of apple green birefringence on Congo red stain. In AL amyloidosis, IF shows staining for a single Ig light chain. By EM, AL amyloidosis will show randomly oriented fibrils that typically measure 8–12 nm in average thickness (Figure 4A). In about 7% of patients with AL amyloidosis, IF with commercial antibodies for light or heavy chains fails to make the diagnosis (56). Moreover, patients with non-Ig–derived amyloidosis with evidence of MG may be misdiagnosed with AL amyloidosis (65). In these patients, LMD/MS can better define the composition of amyloid deposits, providing more accurate amyloid typing (66). This is particularly important for determining the course of treatment and prognosis (67). LMD/MS may also be helpful in differentiating other causes of fibrillary deposits from amyloidosis (68). Currently, the Mayo Clinic and Cleveland Clinic are institutions in the United States that routinely perform LMD/MS analysis. Light microscopy and immunofluorescence findings in light chain amyloidosis and fibrillary GN. (A) Hematoxylin and eosin (H&E) shows a glomerulus with prominent mesangial infiltration by amorphous eosinophilic material consistent with amyloid. Extensive involvement of the interstitium surrounding the glomerulus is also present. Magnification, ×400. (B) Immunofluorescence staining reveals abundant chunky deposits with λ-light chain restriction involving the glomeruli and surrounding interstitium. Fibrillary GN can have a wide range of light microscopic appearances. Magnification, ×400. (C) (Jones methenamine silver stain) shows mesangial expansion and segmental glomerular capillary infiltration by nonargyrophilic deposits characteristic of fibrillary GN. Mesangial areas also show mild segmental proliferation of mesangial cells. Before making the diagnosis of fibrillary GN, amyloidosis should be excluded by showing negative Congo red or thioflavin staining. Magnification, ×600. (D) Immunofluorescence staining in fibrillary GN typically shows smudgy deposits that stain for IgG. Most fibrillary GN will stain for both κ- and λ-light chains (not pictured); however, a minority of patients may show light chain restriction. Unlike amyloidosis, extraglomerular deposits are unusual in fibrillary GN. Magnification, ×400. Comparison of electron microscopy findings in paraproteins with organized fibrillar deposits. (A) Shows the thin, randomly oriented nonbranching fibrils characteristic of amyloidosis that typically have a mean diameter ranging between 8 and 12 nm. (B) In fibrillary GN, the randomly oriented fibrils are often admixed with granular electron–dense deposits and typically thicker than amyloid fibrils, with a mean diameter usually between 16 and 24 nm. (C) Shows microtubular deposits characteristic of immunotactoid glomerulopathy. 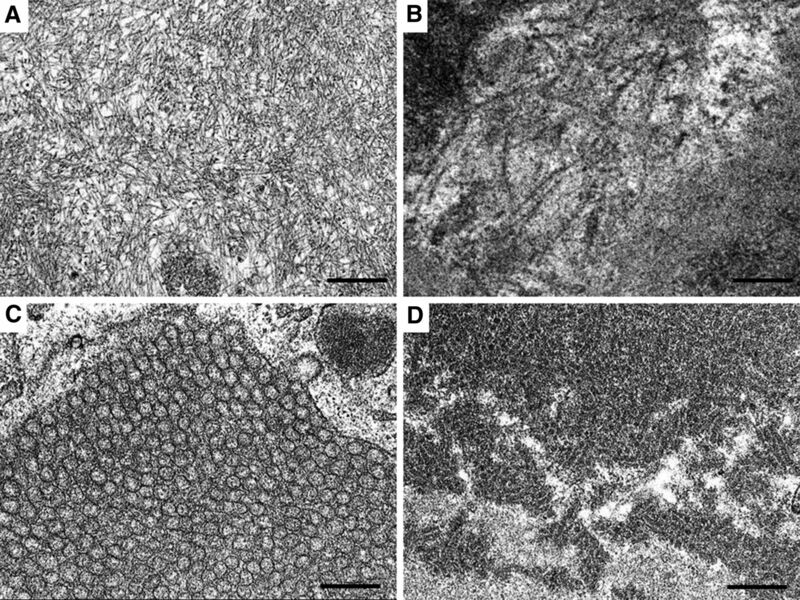 In contrast to the random orientation of fibrils in amyloidosis and fibrillary GN, the microtubules of immunotactoid glomerulopathy are often bundled and stream together in parallel arrays. In this case, the tubules measure approximately 50 nm in diameter; however, the mean diameter of microtubules of immunotactoid glomerulopathy may vary substantially, ranging from 10 to 90 nm. The deposits of cryoglobulinemic GN can range in appearance from microtubular (as pictured in [D]) to being amorphous granular electron–dense deposits showing no well developed substructure. Scale bars, 200 nm. A multidisciplinary team approach involving nephrologists, hematologists, oncologists, and cardiologists is often required in the management of AL/AH/AHL amyloidosis. The goal of treatment is to maximally reduce the monoclonal paraprotein to prevent direct toxicity, improve organ function, and reduce further accumulation of amyloid. Renal amyloidosis also requires fluid management and reduction of proteinuria. Risk stratification on the basis of overall health and extent of extrarenal disease is essential (62). Most low-risk patients are offered chemotherapy followed by autologous stem cell transplant (ASCT), whereas those with high-risk disease may be offered chemotherapy with supportive care. Novel agent–based chemotherapy with bortezomib pre- and post-ASCT has improved treatment response. Bendamustine, thalidomide, lenalidomide, and pomalidomide are available choices for relapsed refractory patients (69). Other drugs include combinations of melphelan, dexamethasone, and proteasome inhibitors (70). Hypotension and intolerance to diuretics because of cardiac involvement and autonomic dysregulation are common hurdles during fluid management. The benefit of angiotensin–converting enzyme inhibitors for control of proteinuria has not been established in these patients. Accordingly, caution needs to be exercised regarding their use given the risk of severe hypotension, especially in patients with autonomic involvement or cardiac dysfunction. Patients progressing to ESRD often have poor tolerance of dialysis with frequent hypotension and have a median survival of 8.5 months (71,72). Patients with ASCT who require dialysis have higher mortality, especially if required within 30 days of the transplant (73). Cardiac and renal transplantation may be considered in those with the primary disease in remission (74). Historically, most patients with AL amyloidosis died within 2 years of diagnosis, highlighting the importance of rapid and accurate diagnosis. Effective treatment can improve overall survival to >5 years as well as improve quality of life (70). Recently, Pallidini et al. (60) developed and validated a staging system to assess renal survival and identify early renal response to therapy in patients with AL amyloidosis. In an analysis of 732 patients over a median period of 40–50 months, proteinuria >5 g/d and eGFR<50 ml/min per 1.73 m2 were the best predictors of progression to dialysis. Pallidini et al. (60) then stratified patients into three stages on the basis of these cutoffs and showed that each stage was associated with a distinct risk of progression to dialysis at 3 years. A decrease in eGFR≥25% at 6 months post-treatment was associated with poor renal survival and identified as a criterion for renal progression, whereas a reduction of ≥30% or <0.5 g/d in proteinuria in the absence of renal progression was identified as a criterion for renal response associated with longer renal survival. FGN is a rare disorder defined by the glomerular deposition of randomly oriented Congo red–negative fibrils typically 16–24 nm in diameter. Although most cases of FGN are idiopathic, associations with paraprotein disease have been documented (75,76). In a case series of 66 patients with FGN (75), 23% had an associated malignancy that was diagnosed 15 years before to 10 years after the onset of kidney disease. More than one half of those malignancies were MM or leukemia. A second case series of 61 patients with FGN reported that 15% of tested patients had evidence of a monoclonal protein in the serum or urine, with most of the other cases associated with autoimmune disorders, hepatitis C, or immune thrombocytopenic purpura (76). In comparison with ITG, the majority of patients with FGN do not have disease associated with MG. Patients with FGN typically present in the fifth to sixth decade of life (75–78). Common clinical features include proteinuria (100%), nephrotic syndrome (38%–52%), renal impairment (66%–72%), hematuria (52%–73%), and hypertension (71%–77%) (75–78). Up to 17% of patients may have a monoclonal protein present in the serum and/or urine (80,81). FGN represents 0.6%–1% of patients in all kidney biopsies (77,79). On LM, the most common patterns of injury are mesangial proliferative/sclerosing GN and MPGN (Figure 3) (75–77). Crescent formation is observed in 17%–31% of patients (75–77). IF microscopy reveals IgG-dominant deposits that, in most cases, are polyclonal and specific for IgG4 (76–78). One study showed that only 11% of biopsies of FGN showed either κ- or λ-light chain restriction by IF (75). These findings are consistent with the current understanding that, although paraproteins have been implicated in the pathogenesis of a subset of patients with FGN, in most patients, the disorder is not associated with paraprotein disease. LMD/MS of glomeruli in FGN shows spectra numbers for apoE and Ig heavy– and light chain C region that are intermediate between AL amyloidosis and ITG (68). The management of patients with FGN associated with paraprotein disease centers on treatment of the underlying clone that is involved (80). Immunosuppressive regimens, including steroids, cyclophosphamide, mycophenolate mofetil, cyclosporine, melphalan, lenalidomide, rapamune, aziothioprine, and rituximab, have been used with limited success (75,76,78). In the largest reported case series of 12 patients with FGN treated with rituximab, four (33%) had no progression of kidney disease, three (25%) had progressive kidney disease, and five (42%) progressed to ESRD (81). Nonprogression was associated with lower baseline serum creatinine, higher baseline eGFR, and shorter duration from diagnosis to treatment. It should be noted that six patients who were tested had no evidence of paraproteins by SPEP, UPEP, or serum free light chain assay. The overall prognosis of FGN is poor, and nearly 50% of patients progress to ESRD within 2 years (77). Recurrence of FGN after kidney transplant is common and may occur in up to 36% of patients (75). ITG, also referred to as GN with organized microtubular monoclonal Ig deposits (82), is defined by the glomerular deposition of microtubules that have distinct hollow centers, which can range in size from 10 to 90 nm (Figure 4C). Because the deposits in ITG can appear similar to those in cryoglobulinemia and lupus nephritis (83), these entities must be ruled out before a diagnosis of ITG can be made. ITG is approximately 10-fold rarer than FGN, occurring in 0.06% of all native kidney biopsies (76). Patients with ITG present similarly to those with FGN with proteinuria (100%), nephrotic syndrome (69%), renal impairment (50%), or microscopic hematuria (80%) (84); however, they have a much higher incidence of MG, associated lymphoproliferative disorder, and hypocomplementemia (76,85). In the study by Rosenstock et al. (76), the incidence of serum or urine MG was 67% in patients with ITG versus 15% in those with FGN. Similar findings were reported in two studies, where a serum monoclonal M spike was detected in 63% of patients with ITG versus 16% in those with FGN (75,84). Among 16 patients with ITG, a hematologic malignancy was diagnosed in >35% of patients (84). The most common malignancies associated with ITG are CLL, LPL, and rarely, MM (76,84,86), and this association is most pronounced in patients who have a monoclonal protein (85). Comparatively, patients with ITG have a significantly higher rate of paraproteinemia than those with FGN (33% versus 7%) (87). The most common histologic findings on LM are MPGN or a membranous pattern of injury, although endocapillary proliferative GN has also been described (76,84,85). Crescents are rare but have been reported in some patients (90). On IF, the glomerular deposits typically stain positive for IgG and C3 and in contrast with FGN, more commonly exhibit light chain restriction. LMD/MS of glomeruli in ITG shows low spectra numbers for apoE and high spectra numbers for Ig heavy- and light-chain C region that help distinguish ITG from AL amyloidosis and FGN (68). The treatment of ITG depends on the treatment of the underlying hematologic malignancy and the clone identified, which may be either a B lymphocyte or plasma cell population (80). The rare nature of ITG has made it challenging to conduct clinical trials. Treatment with steroids alone or combined with cyclophosphamide, chlorambucil, or melphalan has been successfully used to induce complete or partial remission of nephrotic syndrome (85). Fludarabine (76) or a combination of high-dose methylprednisolone and rituximab followed by alemtuzumab (88) has been shown to reduce proteinuria and improve renal function in patients with CLL and ITG. Cryoglobulins are Igs that reversibly precipitate at temperatures <37°C. The precipitation results in symptoms that are seen in vasculitis: rash, ischemia, ulcers, joint pains, fatigue, and GN (89). The pathogenesis of cryoglobulin-induced injury involves two main mechanisms, hyperviscosity and immune complex deposition, that activate complement and induce vascular inflammation (90). The Brouet classification system divides cryoglobulins into three types on the basis of the clonality of the involved Igs (91). Cryoglobulinemic GN occurs in 24% of patients with cryoglobulinemia (92) and can occur with all three types of cryoglobulins, although it is more commonly seen with type 2 in the setting of hepatitis C virus infection. In the largest case series of type 1 cryoglobulinemia associated with MM, six of seven patients were men 28–69 years of age, and all had stage 1 indolent myeloma (93). Three patients had an IgGκ monoclonal protein, three had an IgGλ monoclonal protein, and one had an IgMλ monoclonal protein. Skin changes and rheumatologic failure were the most common presenting symptoms. Renal manifestations were reported in two patients who presented with nephrotic syndrome and AKI. Pathology usually shows an MPGN pattern of injury on LM and hyaline thrombi within glomerular capillaries (92). IF may reveal staining for various Igs within hyaline thrombi and the subendothelial space, and monoclonal light chain restriction may be observed in types 1 and 2 cryoglobulinemia (94,95). On EM, cryoglobulins may appear as paired, curved microtubules with a diameter of 20–30 nm (Figure 4D), although it should be noted that this feature is observed in only a subset of patients. Management of noninfectious cryoglobulinemia has centered on the use of steroids, alkylating agents, and rituximab (86). In patients with cryoglobulinemia associated with a lymphoproliferative disorder, treatment should focus on the underlying hematologic malignancy that is producing the cryoglobulin (80). Fludarabine- and rituximab-based regimens have been used to treat type 1 cryoglobulinemia associated with MGUS, Waldenstrom macroglobulinemia, and NHL (97). Antimyeloma therapies, including bortezomib, thalidomide, and lenalidomide, have shown efficacy in the treatment of type 1 cryoglobulinemia associated with MM (93). Plasmapheresis may be an effective adjunct treatment for patients with severe skin involvement or renal disease if initiated early (93,97). In a single-center study of 66 patients with type 2 cryoglobulinemia, 24% of whom had a lymphoproliferative disorder, treatment with steroids, cyclophosphamide, IFN, or rituximab resulted in complete or partial remission in 16 of 17 patients with kidney disease (98). Crystalline nephropathies caused by monoclonal proteins are well established in the tubulointerstitial compartment, most commonly taking the form of light chain cast nephropathy or less frequently, light chain proximal tubulopathy (LCPT) and/or crystal storing histocytosis (99). Although considerably less common, crystalized monoclonal Igs can also involve glomeruli. The largest and most recently published cohort of patients with LCPT reported the finding of intracellular crystals within podocytes in three patients and parietal epithelial cells in one patient of the total 54 patients in the series (100). Prior case reports have shown glomerular crystals predominantly in podocytes and proximal tubular cells, although one case report mentions crystals also within endothelial and mesangial cells (101). Given the overlap of these patients with crystalline κ-light chain podocytopathies and concurrent LCPT, the pathogenesis of this crystal deposition likely overlaps significantly with that of LCPT. LCPT is thought to occur because of the unique physiochemical properties of a subset of κ-light chains that resist proteolysis within lysosomes and also have a propensity to aggregate into a crystalline structure (102–105). Because of the rarity of this entity and its sometimes indolent presentation, there is no agreement on optimal therapy. Crystalglobulin-induced nephropathy is another entity in which glomeruli can be damaged by precipitation of monoclonal light chains. Unlike the crystalline glomerulopathies described above, crystalglobulin-induced nephropathy results from accumulation and precipitation of light chain crystals that are extracellular but within the glomerular microvasculature. These cases are mainly described in patients with multiple myeloma and typically present with rapid worsening of renal function (106–109). Skin ulcers and purpuric lesions are common in crystalglobulinemia because of precipitation of monoclonal proteins in the cutaneous vasculature. The pathogenesis of crystalglobulinemia remains obscure but may involve Fc-Fc interactions in abnormally glycosylated monoclonal proteins (106). The presence of crystalglobulinemia in patients with multiple myeloma is associated with poor outcomes (109), and initiation of myeloma-directed therapy is the mainstay of treatment in these patients (106). Rare patients with thrombotic microangiopathy (TMA) associated with MM have been reported in the literature (110–115). Many of these patients have documented evidence of renal involvement and clinical features of thrombotic thrombocytopenic purpura, including neurologic symptoms, microangiopathic hemolytic anemia, thrombocytopenia, schistocytes on peripheral blood smear, elevated serum lactate dehydrogenase levels, and indirect hyperbilirubinemia. In one patient, ADAMTS13 activity was low because of the presence of autoantibodies (112). The pathogenesis of TMA secondary to MM may involve paraprotein-induced hyperviscosity, which may cause blood stagnation and microcirculation disturbance. In addition, paraproteins interact with red blood cells, increasing their internal viscosity and reducing their deformability, which may increase their tendency to rupture. Inhibition of ADAMTS13 by autoantibodies may be another pathogenetic mechanism (112). The prognosis of TMA does not seem to be affected by that of MM, which requires aggressive therapy adapted to the clinical setting (116). Other patients with myeloma-associated TMA have been observed in the setting of concurrent κ-LCDD (117), hematopoietic stem cell transplantation (115), and chemotherapeutic agents, such as bortezomib and carfilzomib (114). In addition, there has been one reported patient with TMA with MGUS and an unpublished case report of renal-limited TMA in the setting of smoldering myeloma. Larsen et al. (118) recently described 14 patients with a peculiar form of glomerular immune complex deposition in which masked deposits required an antigen retrieval step to be visualized. Patients were predominantly young women with a mean age of 26 years. All had numerous large subepithelial deposits visualized by EM and C3-predominant staining by routine IF on fresh tissue with weak to negative Ig staining. Repeat IF after digestion of the formalin–fixed, paraffin–embedded tissue with pronase elicited strong IgGκ staining restricted within the deposits. Despite the light chain restriction within the deposits, there was no evidence of a lymphoproliferative disorder in these patients, although no bone marrow biopsies were reported in the study. In 11 tested patients, SPEP and UPEP did not reveal a paraprotein. However, 64% of the patients did have a history of autoimmune disease or vaguely positive autoimmune serologic studies. Patients were treated with a variety of different regimens ranging from conservative angiotensin–converting enzyme inhibition to immunosuppressive therapy with agents, including prednisone, azathioprine, mycophenolate, tacrolimus, and rituximab. None of the patients progressed to ESRD in the mean follow-up period of 15 months. This clinicopathologic description has been named membranous-like glomerulopathy with masked IgGκ deposits. In summary, paraprotein–related kidney diseases represent a diverse group of disorders that result from the abnormal production of Igs or their components with eventual deposition and damage in the kidney. Accurate histopathologic identification and classification are essential for prognostication and identification of the best candidates for treatment. Nephrologists encounter these diseases at various junctures from being the first specialist to make the diagnosis to being the expert called on to assist with planning treatment. A thorough understanding of these disorders as well as meticulous data collection are crucial to strengthen the available evidence. A multidisciplinary team consisting of nephrologists, hematologists, oncologists, pathologists, and other specialists who are able to provide serial long–term follow-up is ideal for the care for these patients.